Tonight we saw a movie I have to rave about just a little – the incredibly charming, “Begin Again.” It is a story about music, musicians, artists, and stars. It starts with both of the main characters in a state of rock bottom in their respective lives, and presents a lovely little story of mutual inspiration and slowly finding your way from a bad place to a much better one. It also heavily focuses on how music can change your perspective, color the world around you, give voice to words you can’t speak, and create joy and meaning. The movie was directed by the same director as the movie, “Once,” John Carney. (*If you haven’t seen Once, stop reading this and go watch it immediately and then come back.) Similarly to “Begin Again,” “Once” is a movie about musicians who find a magical moment of artistic collaboration. Once was a very subtle and moving film. I have to admit, that upon first seeing previews, I was both skeptical and intrigued. It looked like a possibly great little indie film, except that the cast was entirely filled out with entirely too well known actors and musicians (two of which host a reality TV competition). I honestly didn’t have a ton of hope that Adam Levine, Kiera Knightly, Mark Ruffalo, and Cee Lo Green could pull off “subtle” together as an ensemble. But they bring off the roles in this movie with delightful chemistry. In particular, there is a (mostly) wordless scene between Kiera Knightly and Adam Levine that was so well performed by both of them, they had the whole audience gasp out loud. Also kudos to Levine for his role as the douchey over-produced egotistical pop star narcissist. It was a great riff on an entire breed that his current celebrity was born from. Glen Hansard, who wrote the songs for Once (and also starred in it) also collaborated on the songs for Begin Again (which tells you how good they are). However, the chief song writer for the songs in “Begin Again” is actually someone even more familiar, Gregg Alexander, the former front man from the band New Radicals. You may remember their un-missable song from the late 90s, “You Get What You Give.” The songs in this film every bit as hummable as you would expect based on that resume of writers. 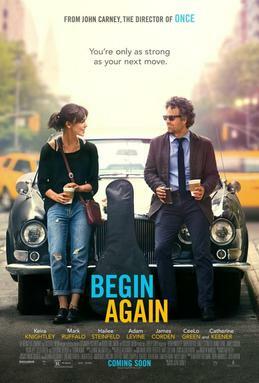 I highly encourage you see Begin Again during your long 4th of July weekend!